Paneer Veggie Grilled Sandwich is a lip-smacking, easy to make sandwich. With just a handful of ingredients, you can have a filling dish for breakfast in under 30 minutes. Can you resist the taste of golden, crisp, grilled sandwich with a cup of hot tea? Grilled sandwiches are a regular fare during weekends in my house. 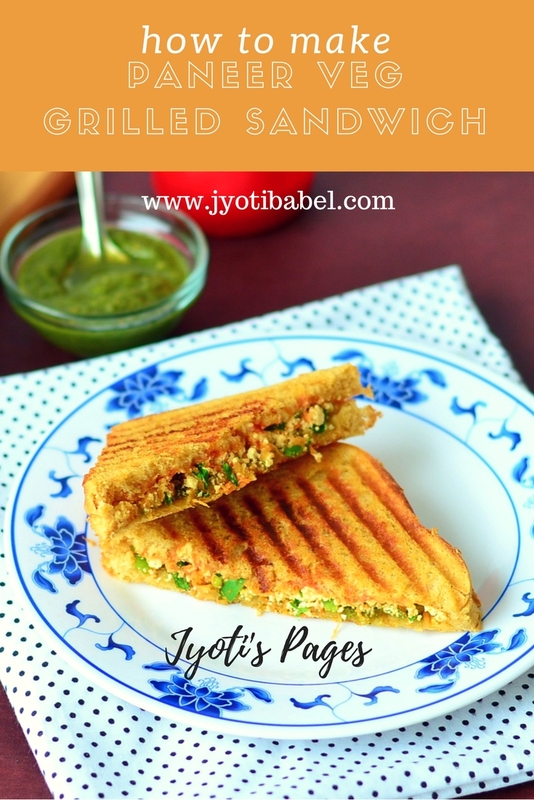 So, on the 2nd day of Week#4 of BM# 79 under my chosen theme of 'Weekend Breakfast Ideas', I am sharing the recipe for a much loved Paneer Veggie Grilled Sandwich. I use freshly made homemade paneer in making the filling for this sandwich. However, you may use grated ready to use paneer also and it will make the process faster. 1. In a bowl, add all the ingredients for the filling and mix. Taste for seasoning and adjust accordingly. Set aside. 2. Apply butter on one side of each bread slice. On the unbuttered side of 4 bread slices apply green chutney and on the remaining 4 slices apply tomato ketchup. 3. Take the slices with green chutney side up and spread the prepared paneer filling. Cover with the bread slices smeared with tomato ketchup with buttered side up. Repeat the same with the rest of the bread slices. 4. Grill them on a sandwich maker till golden lines appear on both sides. Slice them into two halves. 5. Serve hot with ketchup and green chutney and a cup of hot masala chai. Enjoy! If you like sandwiches check out my Bombay Masala Sandwich Recipe. 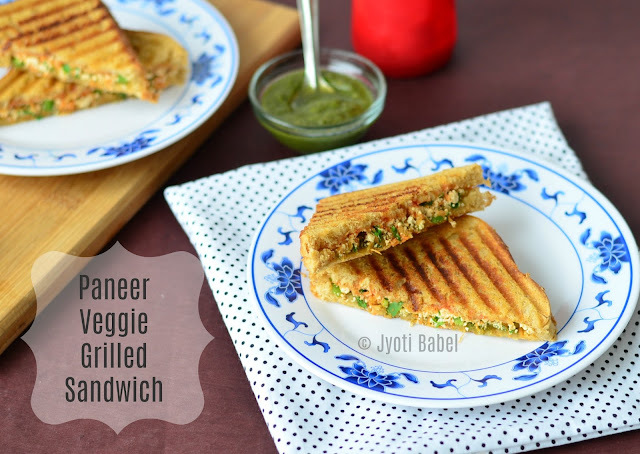 Paneer veggie sandwich is always a hit among all, be it kids or elders. Best thing about this sandwich is the ease with which it is made. Love this kind of quick sandwich, i often make them with eggs instead of paneer. Oh yes this is one dish I can have for any meal, looks so inviting! Delicious protein rich sandwich.. Kids will never say a No to this goodness! !